Global Structural Heart Devices Market size was valued at $6,006 million in 2015, and is expected to reach $12,076 million by 2022, supported by a CAGR of 10.5% during the forecast period 2016 - 2022. A structural heart disease is a non-coronary defect of the heart, thus not affecting the blood vessels in the heart. Most of the structural heart conditions are present since birth (congenital), but these can also be acquired later in life, owing to wear & tear from infection. Advancements in the medical field have replaced the open heart surgical procedures with minimally invasive procedures, such as transcatheter aortic valve replacement (TAVR) and transcatheter mitral valve repair (TMVR). Rise in incidence of structural heart diseases (aortic stenosis and mitral regurgitation); technological advancements; development of innovative repair devices, such as annuloplasty rings, occluders; and increase in demand for minimally invasive techniques are factors that drive the structural heart devices market. However, high cost of surgeries and stringent government regulations hamper this growth. Conversely, increase in focus of key players on R&D activities of structural heart devices and upsurge in demand for quick and long-lasting procedures among the geriatric population are expected to provide lucrative opportunities for the players in the structural heart devices market. 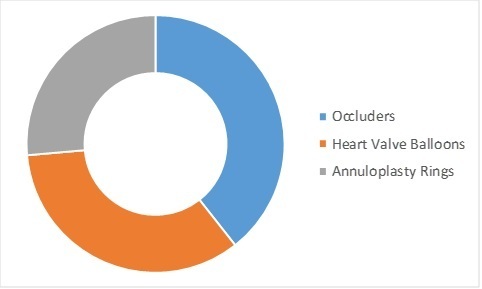 According to AMR analysis, the structural heart repair devices segment held nearly half of the global structural heart devices market size in 2015, owing to increase in prevalence of structural heart diseases. In addition, advancements in repair devices and development of innovative products have further fueled the market growth. Rise in incidence of aortic stenosis coupled with rapid adoption of structural heart devices drives the growth of the structural heart devices market in LAMEA. 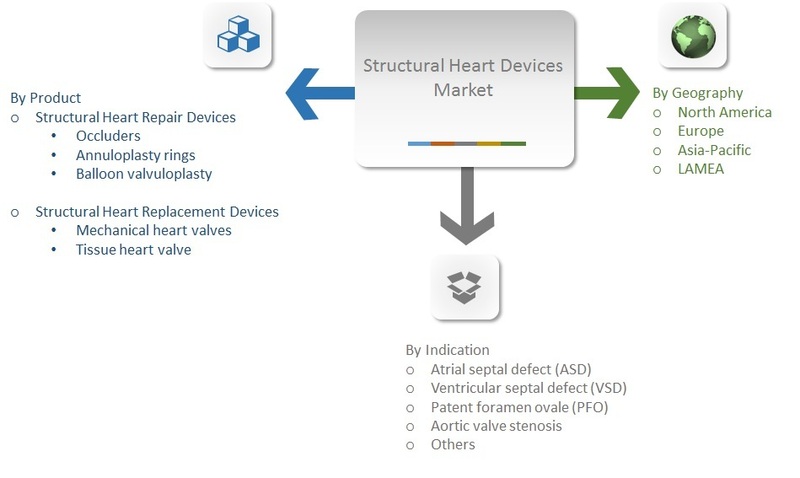 In addition, increased focus of structural heart devices vendors in emerging markets (such as Asia-Pacific and LAMEA) is set to further contribute to the growth of this market. Lack of healthcare facilities and increased need for treatment devices for structural heart diseases have increased the penetration of major players in the Middle East. Nevertheless, the structural heart devices market growth is driven by improving healthcare infrastructure coupled with rise in disposable income. An increase in demand for structural heart devices has been witnessed, owing to the rise in number of patients suffering from structural heart diseases. These disorders are generally congenital; hence, they occur very commonly in a newborn. For instance, as per The Nemours Foundation, about 1 in every 100 newborns suffers from congenital heart defects, which can range from mild to severe. According to Micro Interventional Devices, Inc., in the U.S., about 60 million people, i.e., about 20-25% adult population suffer from structural heart defects. As per the Center for Structural Heart Disease at Henry Ford Hospital (CSHD), in Henry Ford Hospital, about 250,000 patients are diagnosed with mitral valve diseases annually. Moreover, in Europe, the prevalence of aortic stenosis is 1.75 million. These statistics clearly highlight the need for structural heart treatment devices, thus providing impetus to develop new techniques for repair and replacement of heart defects. In 2007, TAVR procedures were approved in Europe and in 2012 in the U.S. Moreover, around 80,000 patients undergo mitral valve repair or valve replacement surgery each year. The upgraded treatments for improving quality of life and increased life expectancy fuel the demand for technologically advanced structural heart devices, such as advanced tissue heart valves useful in structural heart repair and replacement. Further, with the advent of tissue valves used in tissue aortic valve replacement, the quality of life for patients suffering from aortic regurgitation has improved. For instance, in April 2016, launch of St. Jude’s Trifecta valve with Glide Technology (GT), an advanced tissue valve, has made options available for patients in need of aortic valve replacement. Technological innovations result in change in heart-related disorder treatment patterns, lowering the burden of heart disease. Novel tissue valves and mechanical heart valves are widely used to treat structural heart defects with greater longevity. Structural heart devices and techniques are minimally invasive in nature, and are thus highly preferred over other techniques, such as open heart surgeries. Mitral valve replacement, aortic valve replacement, and prosthetic heart valve replacement procedures are minimally invasive procedures widely used by experts in cardiology to treat structural heart diseases. For instance, as per Center for Structural Heart Disease at Henry Ford Hospital (CSHD), around 80,000 patients undergo mitral valve repair or valve replacement surgery annually. Moreover, innovative developments in structural heart devices and procedures, such as aortic valve replacement valves, left arterial appendage closure devices, and advent of tissue or biological valves, are anticipated to provide promising growth opportunities for the market. High cost of advanced structural heart devices and risk associated with the procedures are major constraints for market growth. The adoption rate of technologically advanced structural heart devices is low, especially in emerging economies, as these devices are more expensive than their traditional counterparts. For instance, as per Edwards Lifesciences, cost of SAPIEN transcatheter heart valve with the RetroFlex 3 Transfemoral System is $32,500, which is highly expensive for common people. Furthermore, risks associated with these devices are stroke, kidney failure, and gastrointestinal complications, which are observed after mitral valve replacement procedure. Approval processes for structural heart devices in most of the countries are stringent, as these are highly specialized devices that are introduced in the body. According to the FDA, structural heart devices are classified as class III devices, whereas these devices fall under class IIa (heart valve occluders and tester) and class III (for prosthetic and biological heart valves) category of CE mark classification. In addition, the process is time consuming and requires high investment. According to Advanced Medical Technology Association, it is estimated that about 77% and 80% of the total cost of commercializing a class II and class III medical device, respectively, in the market is spent at FDA-linked approval stages. It offers a quantitative analysis from 2014 to 2022 to enable stakeholders to capitalize on the prevailing market opportunities. Extensive analysis of the market based on products helps to understand the type of devices used to treat structural heart diseases. Comprehensive analysis of all geographical regions helps to determine the prevailing opportunities. Key players and their strategies are analyzed to understand the competitive outlook of the overall market. Extensive analysis is conducted by following key product positioning and monitoring the top contenders within the market framework. The key companies profiled in the report are Medtronic plc; St. Jude Medical, Inc., Braile Biomedica, Medical Technology Est., Boston Scientific Corporation; Micro Interventional Devices, Inc., Edwards Lifesciences Corporation, LivaNova PLC, JenaValve Technology, Inc., and Cryolife, Inc. Other players operating in this market include Corvia Medical, Inc., CardioKinetix, Inc., Biomerics, LLC, Lepu Medical Technology (Beijing) Co., Ltd., XELTIS BV, and Comed B.V.
8.1. ST. JUDE MEDICAL, INC.
8.10. MICRO INTERVENTIONAL DEVICES, INC.
Globally, aortic stenosis is the most common type of structural heart defect leading to death. According to WHO, the elderly population of over 60 years of age is estimated to increase from 12% of total population in 2015 to around 22% by 2050. 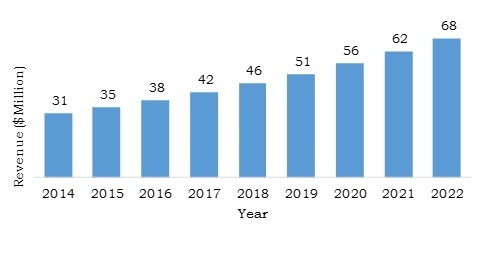 This projected increase in geriatric population, with increased risk of structural heart defects such as aortic stenosis or mitral valve regurgitation, is expected to provide opportunities to medical device companies specialized in treatment of structural heart defects. Aortic stenosis is caused when the aortic heart valve becomes calcified, leading to complete closure and narrowing of the heart valve. Over time, this disease results in disruption of blood flow from the heart, causing heart weakening, and thus can be treated by transcatheter aortic valve replacement (TAVR). Transcatheter-based technologies, such as TAVR and transcatheter mitral valve replacement (TMVR), are preferred widely instead of open heart surgeries for treatment of defective aortic and mitral valves, as these technologies provide array of advantages such as cost-effectiveness, quick post-operative recovery period, and less trauma. Companies offering TAVR devices for treatment of aortic stenosis include St. Jude Medical, Inc., which offers Portico Transcatheter Aortic Valve Implantation System and JenaValve Technology GmbH provide JenaValve Prosthesis-23 mm, 25 mm, and 27 mm.